“It’s hard when you have a veteran, who served the country, but now cannot put food on the table,” said Perry Lighty, a member of the Great Falls Rotary, which was established in 2009 and has 36 members. Lighty said the pantry has 30 pellets worth of food. “We have a lot more supplies coming in,” he said. The rotary and the board raised $30,000 over the past two years to make the pantry possible. It was the brainchild of John Walters of the Passaic County Board of Realtors. A real estate broker, Debra Flowers, who belongs to both organizations, brought the different parties together to make it happen. “I can’t say how proud we are of you. I thank yous all,” said Walters to a small band of veterans at the ceremony. 200 invites were sent out to veterans, said Irma Gorham, director of the Paterson Housing Authority, but a handful attended the event. Mayor Jane Williams-Warren thanked the groups for opening the pantry in Paterson. She knows firsthand what veterans face trying to return to civilian life. Her father served in World War II and her husband is a disabled veteran of the Vietnam War. Williams-Warren’s brother is also a veteran, she said. The food pantry will be open every third Saturday of the month, said Gorham. It will open to the public on the third Saturday of March. 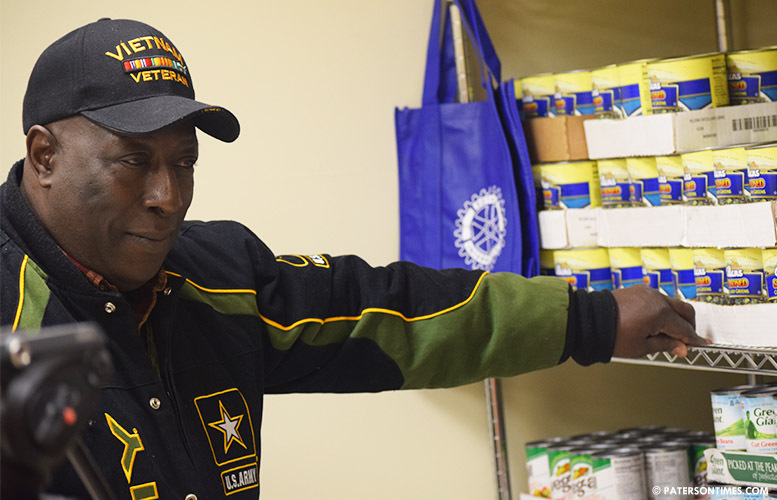 There are other groups that provide food assistance to veterans like the Eva’s Village, Father English, and CUMAC. However, these groups do not exclusively serve the military veterans and their families, said officials. Veterans, who are proud people, sometimes have to be persuaded to accept assistance. “It’s just matter of support from each other. Let them know that it’s okay to be able to use the services that are here,” said Marcenia Cofield, 57, who served in the air force during the successful U.S. invasion of Grenada. “We know they need help. This is the least we can do for our veterans,” said Pascrell.